I have been walking at the same park for years. It is very close to The Cottage. when they enlarged the lake and widened the sidewalk. I was in Texas on holiday and pregnant with my daughter Lauren. and thought that someone had put a mask on the tree. 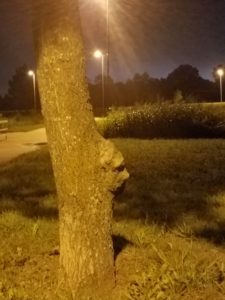 It is just a growth on the tree that looks like a man! and today in the drizzle I did just that. I think that the man needs a name. in the comment section of this post.